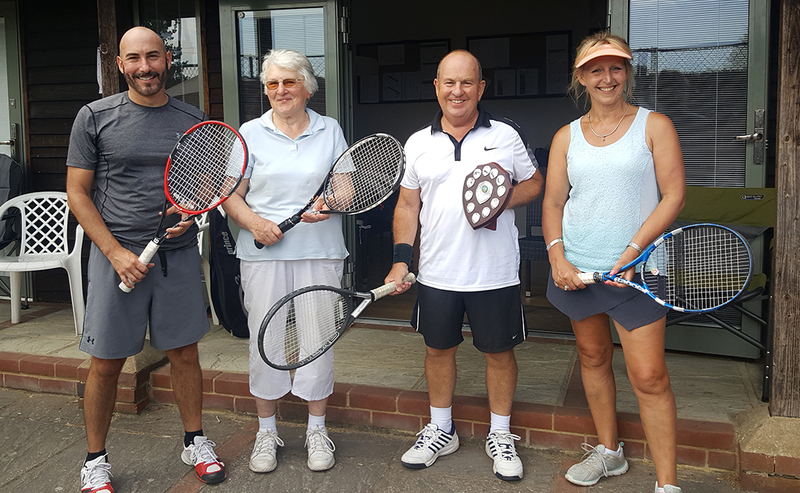 Pirbright Tennis Club runs a summer tournament for women, men and mixed categories, a one day tournament for over 45s (The Jean Seager Tournament) in the summer, and a ladies winter tournament. The club also takes part in inter-club tournaments in our district. This summer's tournaments start on 25th May 2019. The finals will be on 22nd September 2019. To sign up for the 2019 tournaments, please download and complete the form below. For the Ladies doubles tournament please contact Hilary Gower, email: hilarygower@hotmail.com by 12th May 2019. The main banner photo above shows the finalists from the 2018 summer tournaments and the one below shows the finalists from the 2018 Jean Seager Tournament.